"Red Neck Yacht Club" located on Norris lake shoreline provides direct & easy access to low traffic water ideal for personal watercraft. Kayak or paddle board to the nearby Flat Hollow marina for lunch or dinner. Just past the marina is the best ski water so bring your motor boat or ask us for rental details. Red Neck Yacht Club provides plenty of room for everybody. From the parking area, walk into the "Main Level" and find a large, equipped kitchen for the camp chef. Directly off the kitchen is the dining area and great room. 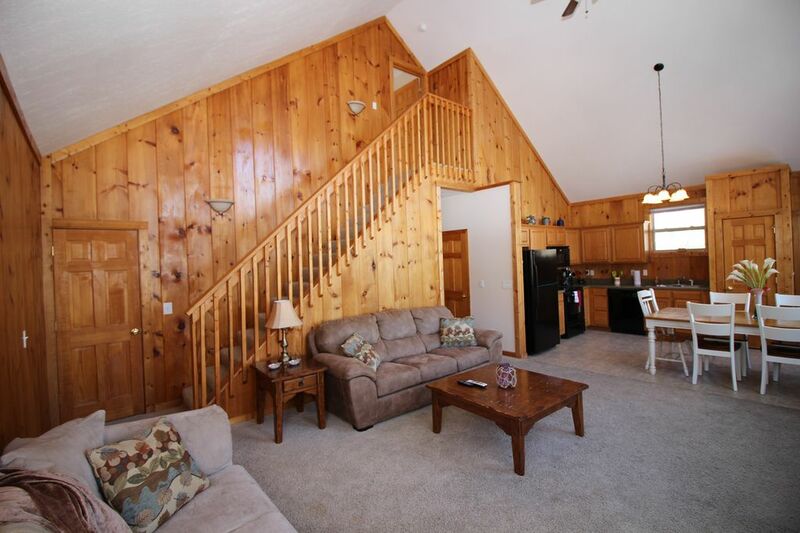 >>Two bedrooms, full bathroom, and laundry room are on this main floor<<. Directly off the dining area is the upper deck overlooking the lake and private dock. The Upper Level has bedroom #3 and full bathroom. The Lower Level, one floor down from the main level provides a 2nd TV room, kitchenette, bedrooms 4-6, full bathroom, and a second deck. The third deck provides your private hot tub and the steps to your private dock. They say 'location' means everything. "Red Neck Yacht Club" is 15 minutes from LaFollette, 10 minutes from the main road, inside a private community, nestled in trees, right on the water's edge. Red Neck Yacht Club cabin at Norris Lake is the perfect place to gather with your friends and family with plenty of space and things to do. Please call us for suggestions on golf, boat rental, restaurants, bedroom details, etc. We are here to assist you. I definitely recommend this house. We stayed at this property over a long weekend a few weeks back. The house was very clean, there were a ton of beds (as listed), and the 3 full bathrooms were great. The house was easy to find. The covered slip was in great shape with the walk to the lake being shorter than a few other places we have stayed on Norris. The house is tucked past the marina through the no wake zone - you will have very calm water. Grill and all kitchen appliances worked fine. Kitchen was well stocked with cutting boards, knives, mixing bowls, strainers, etc. Plenty of dishes to feed a crowd. The property owner was easily reached & quick to respond to all questions. Parking at the cabin is very limited as stated in the listing. If you have more than 3 vehicles you will likely have to leave some at the marina. The marina is a very short drive just down the road. Not directly related to the cabin, but a note for people towing a boat to the property. The listing states no trailer parking at the house for good reason. If you are not familiar with Flat Hollow Marina I recommend you arrive during the day as Flat Hollow has an unusual boat launch/trailer parking set up. You are going to be in some very tight situations around the marina with your trailer so just keep that in mind if you plan to bring a large boat or an inexperienced driver. Wonderful place and location. Highly recommend! What a great time we had at the Red Neck Yacht Club! We were pleased with the huge amounts of beds we had to choose from. We had 2 babies who needed to sleep in playpens we brought and there was ample room to have those in a bedroom as well. Despite the 50+ stairs to the dock, we found it easy to climb. TV worked ok and the kitchen had everything we needed to cook our 18 meals we had to prepare. Only issues that would have made things perfect. * gas grill is falling apart - only 2 burners would light and by final evening only one. Disappointing when you planned all your meals that involved the grill. * ran out of toilet paper on second day. We were left with barely any in main floor bathroom and only one squirt of soap at this sink as well. Again, did not bring these things so had to find a store to replenish. Sharing ahead of time we needed to bring some of these extra items would have been so helpful. Flat Hollow Marina was just down the street by car if you need an ice cream fix. They close by 8:00 so plan accordingly. The area of the lake for swimming without any extra boat traffic was exceptional. If you plan to take a boat out everyday, plan on an extra 15 minutes boat ride in idle speed to get to main lake. This was fun riding past all floating houses to get there. Always something to see. All in all - great family fun! House was clean, nice lake, and good location. Kitchen small for 22 people, grill did not work properly. There are definitely boards on the dock that need to be replaced before someone gets hurt. Also the main refrigerator had difficulty getting cold and every time someone opened it the freezer would automatically open. Make sure you bring your own supply of toilet paper, paper towels, dish washer and dish soap. Absolutely no parking (we also used the neighbors spot). We probably won’t choose this place again, but then again, the known is better than the unknowns! We recently stayed at the Red Neck Yacht club for the DCOM medical school graduation. We had 21 people from 2 different family groups staying together. One family unit was able to stay in the basement while the other utilized the main floor and the upstairs. It was not as handicapped accessible as we thought. Although there is a main bedroom on the main floor there are 5 - 6 steps to get up on the deck. The remaining part of the house is not accessible for wheelchair guests or those who have diffiicuties with stairs. With that many quests from several families there is not enough parking nor is there anywhere close to park a car. Fortunately for us the neighbor was gone on vacation so we used their spots. Only provided with 1 roll of TP per bathroom. We did have an issue with the air conditioner but quickly received portable units to keep us cool. They were delivered at 11:00 pm which we greatly appreciated. We did have a good visit. We stayed with our family at Redneck Yacht Club over Thanksgiving. The number of beds at this location are enormous. We had 2 rooms of 2 bunk beds, 3 rooms of full size beds, and 1 queen suite. There are 3 full baths altogether. The great room overlooking the river is large and welcoming. I would recommend bringing any large or specialty cooking items you may need. The owner was very accommodating and offered to have his maintenance person bring us what we needed but it was Thanksgiving day and I did not really want to impose on anyone else’s family time so we ran to the store to purchase a few 11x14 baking pans. I’d also recommend requesting spac heaters if staying in the winter months as 2 of the basement bedrooms do not have heat. We had a great time and would definitely consider this cabin for a future trip. It was so beautiful in the fall I can only imagine how the summer must be!